Win it for Manny was the plea. Indeed, the caveat from Las Vegas was that if you lose your focus even for a moment, you get floored. The lesson, apparently, was not heeded. And so, for the second time in four days, Filipinos – not just the sportsmen, but an entire nation that loyally follows its heroes – found themselves on the canvass knocked down by a killer blow despite leaving the door open only for the briefest of moments. That moment, for Singapore, came in the 18th minute of an eventful AFF Suzuki Cup semi-final second leg match at the Jalan Besar Stadium. A freekick from an innocuous position was quickly taken and slipped to Khairul Amri. Amri took the ball inside while the entire Philippines defence was caught flatfooted; then curled a shot past the helpless Eduard Sacapaño and into the net. The wall of Filipino defenders spotted the threat a fraction too late; enough, at any rate, for Amri to send Singapore into the final. Crucially, despite the improved territorial advantage in the second half, the Singaporean defence held firm and limited the Philippines to mere half-chances. In fact, Singapore at times were doing a Philippines and packed the front of its goal with warm bodies. Not without having to endure a second half siege from the Philippines, who have already been branded by the pundits as a second half team. True to form, the Philippines saw more of the ball after the break and started to weave the patterns that the Singaporeans enjoyed so much of in the first half. 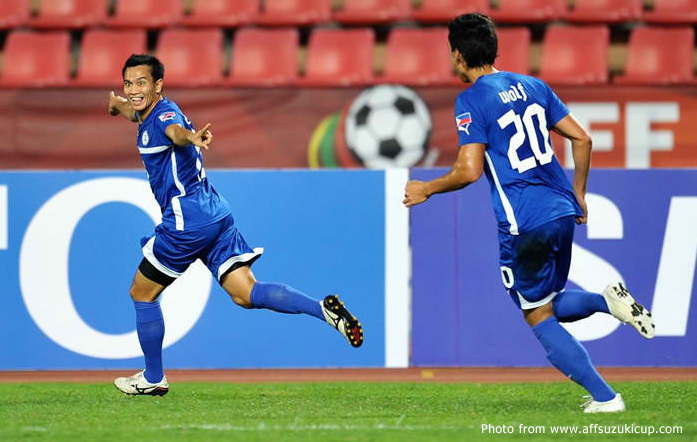 Central to the transformation was the introduction of captain Emelio ‘Chieffy’ Caligdong, who gave the Philippines the speed and urgency that was not there in the first half. His presence gave his team width and his combination with Dennis Cagara enabled the Philippines to deliver quality crosses into the Singapore penalty box. Crucially, despite the improved territorial advantage in the second half, the Singaporean defence held firm and limited the Philippines to mere half-chances. In fact, Singapore at times were doing a Philippines and packed the front of their goal with warm bodies. The most clear-cut of the Philippines’ half-chances came from a quick counter after Singapore failed to take advantage of a promising chance inside the Philippines’ penalty box. 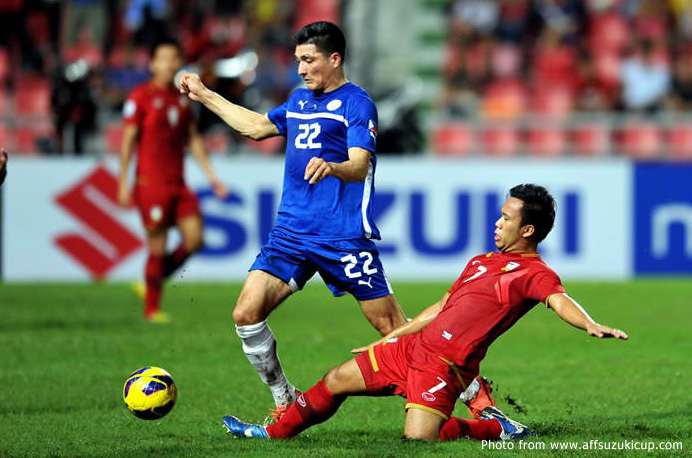 Phil Younghusband – well shackled by the Singaporeans and subject at times to downright thuggery – shot from outside the box; but his endeavour only yielded a corner from which the Philippines could not benefit. When the referee blew the final whistle after three minutes of added time, the Philippines were probably wishing that it could exchange its two friendly victories over Singapore earlier this year for a slot in the final. For now, at least, the journey ends. While it may have ended in disappointment, the fact that it did should not be allowed to detract from the ride. This was a totally different experience – for players and supporters alike – from the same stage two years ago at the Bung Karno. Whereas, in 2010, the Philippines being in the semi-finals was not unlike being an uninvited guest who had gone farther than he was supposed to go, in this year’s semi-final the Philippines were a team that knew it actually had a chance of going all the way. That alone made the ride exhilarating; and despite the nail-biting second half at the Jalan Besar that ultimately ended in disappointment, let it not be forgotten that it was a two-time former champion that was defending for its life. Congratulations are in order, then, for Singapore, who earned the right to play for their third AFF Suzuki Cup title. On the balance of play and chances created, the Singaporeans probably deserved to win. They took the game to the Philippines in the first half; and while not unduly troubling Sacapaño despite their superior shot statistics, all Singapore ultimately needed was just one opening to deliver the killer blow. For the Philippines, meanwhile, leaving the tournament does not at all take the sheen from bright future that they undoubtedly have. Except for one or two players, everyone at the Jalan Besar will in most probability still be around for the 2014 edition of the cup. Most of those who played in the tie were not even involved at the Bung Karno two years ago. 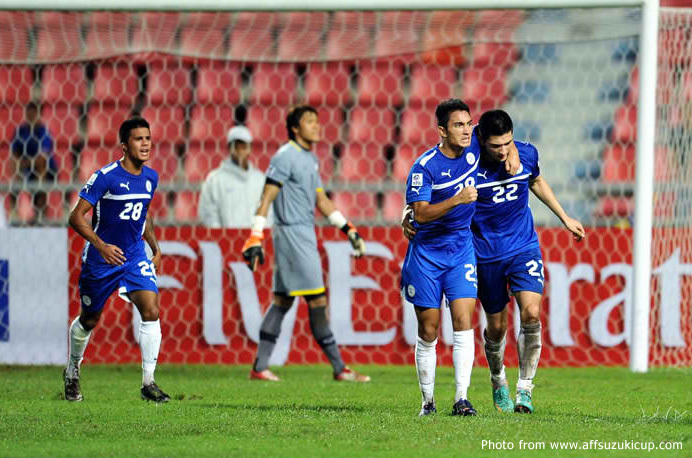 The experience this time around – both at the Rizal Memorial and in Singapore – will be invaluable two years from now. Particularly the lesson learned today, something that the late and great Brian Clough used to preach – that it only takes a second to score a goal.